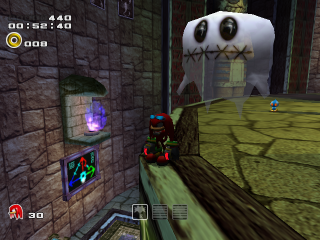 Boom Boo (ブー) is a ghost that appears in several haunted stages of Sonic Adventure 2. It looks like giant versions of Boo normal type and only has one attack, which is to slowly move towards the character when in sight. Hitting them once will reduce their size, to a larger version of Boo attack type and another hit will make them Boo attack types completely. Therefore they take three hits to disappear and award 300 points. It should be noted that throwing objects doesn't affect ghosts. Boom Boos also appear alongside their smaller relatives in the Wii U/PC version of Sonic Lost World, found exclusively in Sky Road Zone 4. Here, they are indestructible obstacles that move left and right with Boos following them and must be avoided at all costs. They have also appeared in Sonic Runners as stage hazards in Desert Ruins. This page was last edited on 12 October 2018, at 18:43.